These recent years we have seen a slow but steady buildup of VR from both technological developments to growing enthusiasm shown by consumers and the industry. Today AMD is releasing the Radeon Pro Duo to the market as their first card targeted at VR developers. This card is not being directly aimed at gamers, despite the capability under the hood, but focuses on official support for professional software. Additionally, multiple initiatives are being both spearheaded and supported by AMD and others to encourage growth in the VR sector. 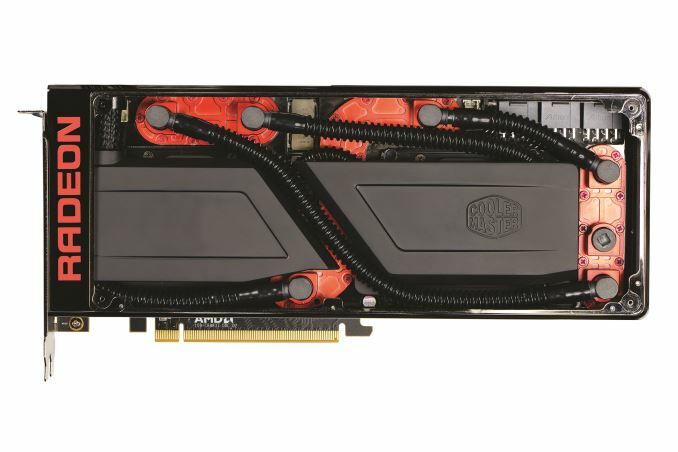 The AMD Radeon Pro Duo was first announced back in March, with the card is being marketed for VR content creation first and foremost. With this card, AMD is promoting the ability to allocate one GPU per eye while powering VR experiences. This way the case is opened up for performance beyond what any other single card can offer today. Another use case for developers is offloading compute work to the second GPU while the first is used for graphical work which can make for a much smoother experience during demanding a workflow. Gaming is definitely possible on Radeon Pro Duo and alongside the FirePro drivers for content creators, Radeon drivers will be available. The Pro Duo will not see validation for as many applications as a true FirePro card, but official support will be provided for applications important to gaming content creation such as Autodesk, Maya, and Blackmagic Davinci Resolve. Moving past the cooling solution we get three full sized DisplayPort connectors and one full-size HDMI port. On the side of the card there are three 8-pin PCIe power connectors which will do more than an adequate job of supplying the rated 350W power draw. 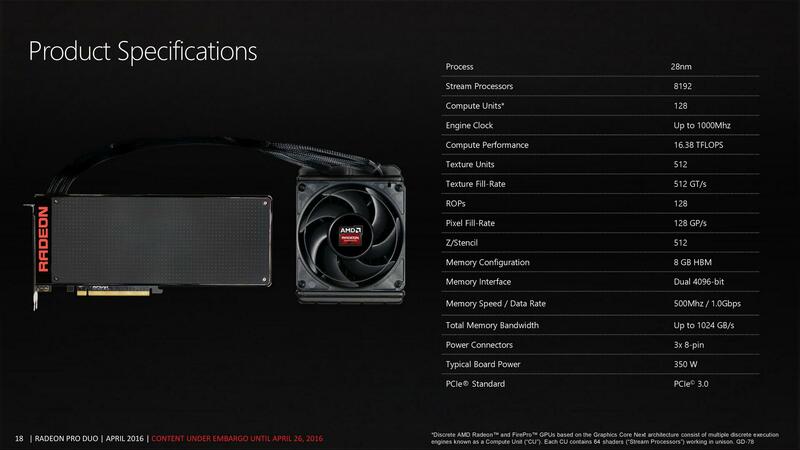 Note that 350W is the equivalent of dual R9 Nano cards (rated at 175W a piece), and will be clocked similarly. The reactive frequency adjustments to heavily loading, by inference, are likely to be similar but we expect AMD to be using low-power binned parts for their new high-end card. The Radeon Pro Duo is launching today at $1500, or three times the current price of the R9 Nano. That’s a $500 price premium to combine two cards into one. Even with the price, AMD is keen to admit that the Radeon Pro Duo is now the single fastest graphics card on the market since the competition doesn’t offer a similar product at this time. From our perspective at AnandTech, we still advise that users are better off investing in a single powerful GPU first, and only scaling out into SLI/CF when requirements for extreme performance are such that a single GPU solution cannot provide. With VR, it stands a good chance at pushing gaming machines harder than anything we’ve seen so far, especially when trying to maintain a smooth and low latency experience. It all depends on the workflow and subsequent frame rendering methods used. Alongside all of this news and information is renewed attention for several initiatives AMD is taking part in. 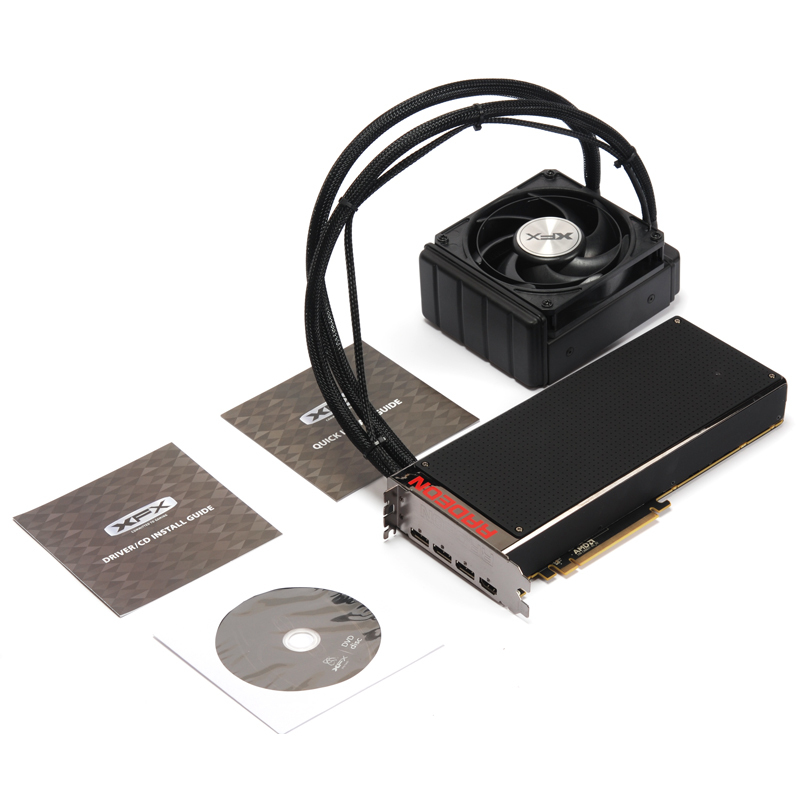 AMD has placed the Radeon Pro Duo as the first card in their AMD VR Ready Creator Line. The goal being that the Pro Duo, coupled with Liquid VR, will create a powerful and capable platform to develop future VR experiences. The AMD VR Ready Creator Line is also the platform of choice for Crytek’s VR First initiative, which intends to foster growth in the VR industry by supporting developers by powering virtual reality labs in colleges and universities around the world. We are approaching a crossroads between the outgoing GPU generation and the upcoming cards coming out later this year. The Radeon Pro Duo is part of an outgoing generation but aims to provide a competent platform for VR content creation following known architecture guidelines. Along with the new hardware released today, there are many initiatives in motion that aim to encourage growth in VR, and new hardware will continue to be an important tool for creating innovative experiences moving forward. We have already seen Tmall post up an early listing for an XFX variant of the Pro Duo, and retailers should be showing other OEMs variants today as well. 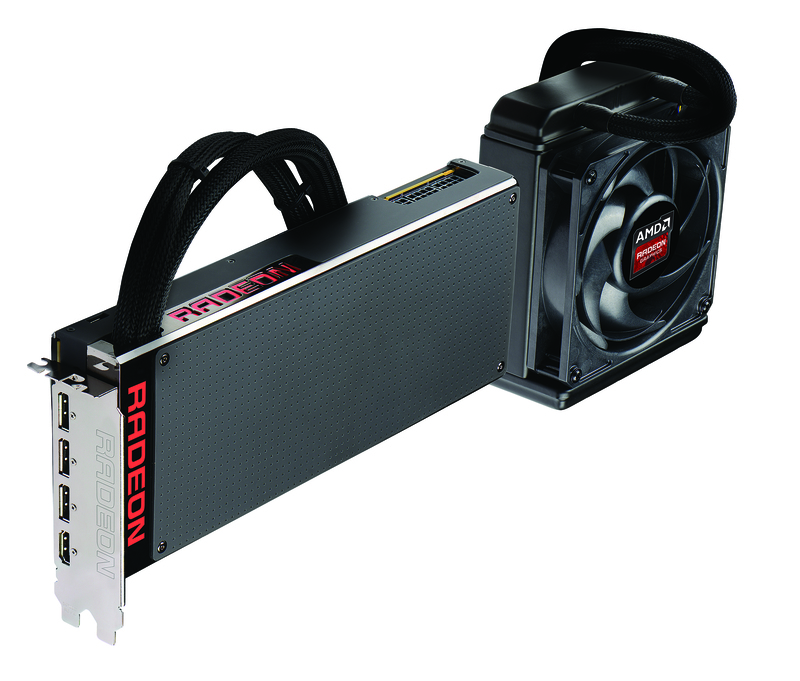 At current, AMD's base design is expected to be the sole variant of the Pro Duo. This has to be one of the dumbest comments I have read.. Most gamers do not use steam yet most games use steam... So I guess you do not play games. Gaming for 24 years and have had steam since orange box. I'm actually wondering what you think buying a physical copy does for you.. it does nothing considering you still cannot install the phsyical copy of a game without steam.. Steam is something the MAJORITY of gamers are FORCED to use, but they still use it. Gonna continue talking our your derriere?